THOMSEN’S DECORATING CENTRE 2A-2135 Dorchester Road DORCHESTER 519-268-1945 BASKIN FABRIC CENTRE 637-639 Talbot Street ST. THOMAS 519-631-3484 GODERICH RONA 121 Huckins Street GODERICH 519-524-1778 Effective from May 1st to August 31st, 2015. † Purchase a minimum of 4 Silhouette® with UltraGlide® and receive a $250 rebate. Also, when you purchase any number of these additional shades, you’ll receive an extra $50 for each. Valid at participating retailers only. The rebate will be issued in the form of a Hunter Douglas Prepaid American Express® Gift Card. THE PROMOTION CARD is a trademark of The Hunt Group. All Rights Reserved. THE PROMOTION CARD is a Prepaid American Express® Card issued by Amex Bank of Canada. ® Used by Amex Bank of Canada under license from American Express. † Purchase a minimum of 4 Silhouette ® with Ultraglide® and receive a $250 rebate. Also, when you purchase any number of these additional shades, you’ll receive an extra $50 for each. Valid at participating retailers only. The rebate will be issued in the form of a Hunter Douglas Prepaid American Express ® Gift Card. THE PROMOTION CARD is a trademark of The Hunt Group. All Rights Reserved. THE PROMOTION CARD is a Prepaid American Express ® Card issued by Amex Bank of Canada ® Used by Amex Bank of Canada under license from American Express. This is an addition to a heritage home built in 1868. The new addition replaces an old one put onto the original home in the 1930â&#x20AC;&#x2122;s. It features a full basement, new bathroom and is accessÂ­ ible by a new wheelchair ramp. RESTORATIONS & RENOVATIONS We specialize in blending your new project into the existing structure all while working with you to choose the right materials and construction techniques to ensure your restoration, addition or renovation will harmonize with the style of your home. meadows of sUnningdale This picturesque community of 56 one-floor units is taking shape at Sunningdale Road and Meadowlands Way, just west of Richmond Street. Stone and stucco exteriors plus flat roofs give these homes a European flair, Mescia says. pursuing dinner. Since chemicals have become so prevalent in the products we use, some readers will be interested in natural protection options. On page 54, Ellen Ashton-Haiste’s story details safer, naturally sourced products available at stores in and around London. In Southwestern Ontario we are fortunate to be surrounded by three of the Great Lakes, and spending time on the waterfront is always a summer highlight. On pages 47 and 49, we have outlined options for dining and overnighting along the shores of Lake Huron. On page 16, a new development in Port Stanley gives homebuyers lakeside options. Exploring Ontario’s coastlines could be enhanced by a recreational vehicle. RVing is becoming more popular as baby boomers look for active ways to enjoy their leisure time. Some prefer to go big and others want to be as compact as possible, but all agree that the ability to take their own beds, move at their own pace and see sights on their own timetables are what attract them to living life on the highway. My story on page 9 outlines options for those considering hitting the road. However, there really is no place like home and London is lucky enough to have plenty of opportunities to get out and enjoy summer fun. On page 40, Richard Young details the many concert options available in the next couple of months. So push back from your desk, say so long to daily obligations and hit the road in pursuit of excitement or cocoon on your own deck or patio. Summer’s fine weather is fleeting and those much-vaunted lazy days are gone too soon. 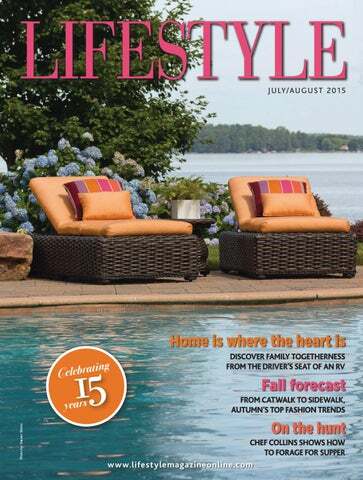 Lifestyle Magazine thanks Hauser for the use of the cover image as an example of living the outdoor good life in summer. The Lifestyle Magazine team wishes you bon voyage as you explore summer’s myriad delights. They camped in tents with their sons as they grew up, but decided to move up to a camper 10 years ago. “It’s easy to lie down and sleep on an air mattress, but it’s hard to get up in the morning,” she laughs. The concept of having one’s own bed and belongings along for a trip is echoed by many who pursue the RV and camping lifestyle. Wayne and Dianne Moser – both 62 – travel in a 45-foot Mirage Prevost. No matter the size of your camper, travelling the country with your home on wheels offers plenty of opportunities for exploration, relaxation and quality time with family and friends. Many RVs have luxury amenities like marble counters, leather couches and large-screen televisions, making them feel more like hotels on wheels than simple places to sleep. Kirk Thomson, owner of Can-Am RV, says that domestic travel is up since the early 2000s. Popular with retirees are the state-of-the-art luxury motorhomes like the Mercedes Interstate Class B shown here. thank you! We couldn’t have done it Without you. Prespa Homes is set to break ground this summer on a gated community of 15 three-storey, single-family detached condominiums overlooking the beach. Above Many mistake this for a century home because of the wealth of antique and salvaged materials and hardware built into the home by its original owner. Unique elements include antique duct grates, a solid metal pillar in the master bedroom and another in an upper bedroom that has a raised image of Neptune, identical to one the owners have seen on a historic building in Strathroy. A bright and airy dining space adjacent to the kitchen overlooks the property’s lush greenery. TOP The cozy formal living room and dining room are separated by a three-sided gas fireplace with a marble mantle. BOTTOM A wrought iron patio overlooks the backyard swimming pool. to a covered patio. An awning extending from the patio ceiling can be lowered right to the ground. “We’ve sat out here while it’s been hailing and were quite comfortable,” Bob notes. Steps lead down to an in-ground pool. The .64-acre property also includes an extensive rear lawn with space for a soccer pitch as well as access to the Thames River. The home’s upper level includes three bedrooms and an updated full bathroom. The rear bedroom has a wrought-iron fenced balcony that overlooks the pool and patio. The lower level is the only area that Bob and Sue renovated. Unfinished when they moved in, it now includes an office, home gymnasium and large rear theatre room with surround sound and a three-piece bathroom. This level is carpeted, except for hardwood in the exercise area. Original antique doors hide the furnace, mechanicals and additional storage. There’s also a convenient walk-up to the garage and rear yard. Oversize window wells admit natural light and would allow the office to be used as another bedroom. b kitchens, bathrooms, basements, renovations, additions and custom homes By removing walls, and adding flush beams, this once closed-off kitchen has become an open, bright and functional living space. see our Houzz profile for more pictures of this and other renovation projects. We provide wedding flowers, special events sympathy arrangements and much more. TOP This three-storey home in Grand Bend was built with main-floor living in mind. Everything the owners need access to is found on the main floor, including the kitchen and laundry facilities. LEFT The open-concept kitchen and comfortable great room are separated by a double-sided gas-log fireplace set in Wiarton ledgerock. Large windows provide lots of natural light and riverside views. Everybody knew their proper place in the sports car chain. Then we went and created this: the new F-TYPE Coupe. Crafted in lightweight aluminum for stunning responsiveness, and stirring things up with 550 supercharged horses in “R” trim. In fact, it even overpowers Porsche 911 Carrera S and Audi R8 4.2, with plenty to spare. Status quo be damned. This changes everything. Windows & Doors TOP Shaker cabinet doors with bead moulding, seedy glass in the upper cabinets, a pine ceiling and the subway tile backsplash give the kitchen a cozy country ambiance. RIGHT A blue and white nautical theme runs throughout the home, as the owners are avid boaters. BOTTOM The island is the star of the show in the kitchen, with an eye-catching dark blue base topped by grey and black granite that matches the perimeter counters. rative vases and teapots as elements that create that atmosphere. The home is designed for mainfloor living. “We built with aging in mind,” she says. “Everything we need is on the main floor, including the laundry.” The entrance foyer accesses the front-facing master bedroom and ensuite bathroom, featuring an oversize marble shower, stand-alone soaker tub and marble-topped vanity. Across the rear of the house is the open-concept kitchen and great room, which are separated by a double-sided gas-log fireplace set in Wiarton ledgerock. A focal point of the kitchen, with its creamy cabinets, is the nine-byfour-foot island with a contrasting dark blue base and grey and black granite top matching the perimeter counters. A built-in mini-bar with dark blue cabinetry complements the island base. Four banks of tall windows across the kitchen, the adjacent eating area and great room overlook the rear patio and river and let in abundant natural light. This bright, open area is a family favourite. “I love to stand at the island and work and enjoy the river views.” An open staircase between the foyer and kitchen/great room leads to the home’s upper and lower levels. The loft-like upper storey includes an office, guest bedroom and what she calls “the dorm.” The long room, furnished with double and bunk beds to sleep 10, is designed for visits from the five grown children and their friends. This level also has a full bathroom. The lower level is entertainment central, with a full bar and pub, featuring a ledgerock wall and a stone archway separating the pub/bar from a theatre room. Behind the bar is a full kitchen, by Distinctive Kitchens of London, with bright cherry-red cabinets. “We do a lot of entertaining, so this is perfect, with the theatre, bar and outdoor access plus the kitchen where guests can bring in dishes and we can prepare dinners.” This level has a walkout to the paving stone patio with its barbecue and eating area, linear gas fireplace also set in ledgerock, a sitting area and a resistance pool with three waterfalls that allow it to double as a water feature. This lower level also includes a full bathroom and large craft room that could alternatively provide space for an office, bedroom or exercise room. n * Names withheld by request. We can make your house a home. Glass. Pottery. Textiles. Wood. Furniture. Candles. The ages of the women-only groups range from 40 to 80, with the majority being 50 to 70 years old. Some women go on mother/daughter trips together as part of the group. “Though group travel is common, with our groups a woman never feels like a third wheel. They can really let their hair down and relax.” Specializing in unique escorted tours, group travel planning & getaways for women. l Broad Escapes is an all-female travel network that co-ordinates female-friendly tours and provides a forum for like-minded women to share travel experiences. hs. Pack your bags....we’d love to have you join us! For a thirst-quencher on a hot day, Munnelly says to look closer to home for dry Rieslings, such as Cave Spring ’13 Dry Riesling (VQA Niagara). “Many people say they don’t like dry Rieslings, but on a hot day it’s really refreshing. Sometimes, after I’ve served them a couple of glasses, they’ll say they don’t like dry Riesling and I’ll say, ‘That’s what you’ve been drinking.’ They are always surprised.” When in doubt about what to serve on a warm afternoon or evening, think about countries where they celebrate summer, such as Spain, Italy, Portugal and the South of France. “That fills out the picture,” chuckles Munnelly. Two whites from these regions are Munnelly’s summer faves. For a party social white, he recommends Villa Sandi ’14 Pinot Grigio (Italy). Though some wine lovers feel Pinot Grigio is too pedestrian, Munnelly says it’s perfect for a social occasion because it doesn’t become a distraction from the event. He calls it “the background music of wine.” For a lower alcohol libation to serve, try Vinho Verdes from Portugal; he recommends Aveleda ’14 Vinho Verde, a great idea if you’ll be enjoying several glasses of wine through the afternoon or evening. Summer gatherings often revolve around grilling goodies for the crowd to enjoy and serving the perfect wine alongside will make you the perfect host. Billy’s recommendations: With juicy, smoky grilled hamburgers, serve Louis Bernard ’13 Côtes-du-Rhône (France), as it’s a fuller bodied wine to serve with heartier fare. With succulent grilled salmon, service Lindeman’s ’14 Pinot Noir (Australia). The outdoor Farmer’s Market is open Thurs. 8 - 2 pm and Sat. 8 - 1 pm And while you’re there, visit our indoor market featuring: fabulous restaurants • unique gifts and jewelry foods from around the world • organic and vegan fare services that will surprise you… and so much more! Let us plan your next Staycation! Stephenson Home Improvements has been run locally for 56 years. Carl and Marvin Stephenson are brothers and owners of the business that their father began in 1959. The company is so confident in what they do that they stand behind their workmanship with a lifetime guarantee. Work is never subcontracted. In fact, every job is priced by a Stephenson and the work is done by a Stephenson. They value their customers, whose satisfaction is top priority! Since all the employees are Stephensons themselves it makes them even more determined to uphold their name. Every quote is free and they have a large showroom for you to visit, view and try out their products. Some of the most common and accessible ingredients in Ontario are fiddleheads, dandelion greens and mushrooms. Foraging is great exercise with a chance to see flowers, birds and all kinds of wildlife – often without cellphone service. Interior Doors, Trim, Door Hardware and So Much More! Free Delivery ON EvEryTHINg WE SEll! ✪ Newly renovated designer/homeowner friendly showroom. ✪ Southwestern Ontario’s largest in-stock selection of doors, trim, and hardware. ✪ Servicing new home builders, renovators, and homeowners. ✪ In-house custom pre-hanging and door machining. ach summer, London hosts three major outdoor music festivals – TD Sunfest, Rock the Park, and the Home County Music and Art Festival – attracting thousands of Londoners and visitors. For many people, they have become synonymous with summer in the city. “They are prototypical examples of the kind of events the community wants to experience,” says John Winston, Tourism London general manager. “Their contribution to cultural vibrancy, diversity and inclusion in our community is significant and they have become a mainstay of the summer.” Certainly, in terms of musical variety and tastes, the three festivals offer something for everybody. The 42nd edition of the Home County Music and Art Festival, London’s longest-running outdoor summer music festival, sets up shop in Victoria Park July 17 to 19 with a lineup of local, regional and national performers reflecting the festival’s evolution. “Over the past 10 years, Home County has expanded its music programming beyond the confines of traditional folk music to include more contemporary styles of Canadian music,” says artistic director Darin Addison. “Many younger acts are incorporating traditional instruments into current songwriting methods. Folk music has also evolved over the past 42 years.” Headliners include Sarah Slean, who opens the festival with Canadian astronaut Chris Hadfield emceeing on Friday, followed by family act The Leahys on Saturday. Sylvia Tyson closes on Sunday night. Admission is by donation. MiniMize your risk... MaxiMize your retirement savings! Glory in the glass Elgin County home to prolific artist By Ellen Ashton-Haiste This large black dragon panel, with layered glass scales and horns, won awards at both the World Fantasy Convention and Dragon Con, the world’s largest fantasy/sci-fi convention. Garrett-Jenkins’ first project, a Japanese crane window made for her mother, is on display at Rubyeyes Kraftwerks. ABOVE “Rocky Mountain Meadows,” a painting on glass using crushed glass as the medium, was a Juror’s Choice award winner at the Art Emporium 1-2-3 Foot Squares Show in Port Stanley last November. RIGHT Garrett-Jenkins’ popular glass poppies generate funds for the Port Stanley Legion poppy fund. Cheryl Garrett-Jenkins creates one-of-a-kind glass artwork in her Port Stanley studio. galleries W Art, e frame... Spor Mirror Exce ts s. p Need Jerseys. P ricingtional lewor Fram ! and m k uch Quot ing more are F es ! ree! MADAME VANIER Children’s Services is planning a staff reunion at the Hellenic Centre on October 2, 2015 to celebrate its 50th ANNIVERSARY! If you are a former staff or teacher, we want to hear from you…sue@vanier.com OR check out www.facebook.com/vanier50 The celebrations continue the following night with a Blues Bash being held at the London Music Hall! Celtic art is a recurring theme in Garrett-Jenkins’ artwork. ort Stanley’s annual Harbourfest returns to the picturesque Lake Erie port August 8 and 9 with a full slate of activities and events for all ages. “This is the fourth year for the event,” says organizer Michelle Fournier. “Our mandate as always is to attract people to the port to show them our harbour and hospitality.” Last year’s event was held on Labour Day weekend, but organizers feel going earlier in August this year will be less likely to conflict with other events in the area. Tall ships have always been part of Harbourfest, but Fournier says organ­ izers want the event to be about more than just tall ships. This year only one tall ship, the Pathfinder, will be in port and be available for dockside tours and cruises throughout the weekend. The Pathfinder is a two­masted sail­training vessel operated by Toronto Brigantine. With the exception of the captain, the crew are all 13 to 19 years old. Cruises depart on Saturday and Sunday. Cruises are two hours includ­ ing a half­hour for pre­boarding. Tickets are $40. Dockside tours will be random and by donation. On Friday night, Canadian band Great Lake Swimmers will be perform­ ing at the Port Stanley Legion. TAKE IN THE BEAUTY AND FUN! Food with a view” is how the Growling Gator could be described. As the anchor of the Grand Bend strip – the part of Main Street that cars prowl up and down on summer evenings – the Gator offers diners a panoramic peek at Lake Huron. Having enlarged the patio and with a menu that caters to an eclectic palate, with choices from New York steak to Aegean shrimp to Cajun jambalaya, the Gator has upped its game from a little place with pub grub to an eatery that can please the taste buds as well as the eyes. Though the Gator still carries favour­ ites like chicken wings, sandwiches and burgers, the healthier menu choices are delicious as well – try the pear and goat cheese salad. Sitting next to Purdy’s Fisheries on the Grand Bend pier, it’s not surprising that Smackwater Jack’s Taphouse offers fresh perch and pickerel caught from the blue waters of Lake Huron. Owner Brad Oke takes pride in offer­ ing fresh, locally­sourced ingredients in Smackwater Jack’s dishes. Featuring choices made with pork and beef from Metzger’s Meats, turkey from Hayter’s Farm and lamb and duck from area farms, Smackwater Jack’s menu is as sustainable as it is delicious. For a decadent bite, try specials like the lobster ravioli in truffle sauce or the perpetually popular roasted garlic bacon dip. Because they want the whole family or party of friends to be able to enjoy the hospitality at Smackwater’s, they offer shuttle services to visitors in Grand Bend and as far away as Bayfield, Ipperwash and Exeter at no cost. Tips are donated to Mothers Against Drunk Driving and they’ve been able to give $2,500 so far, according to Oke. Both of these eateries offer a view of one of the world’s best sunsets over Lake Huron. an old website,” Pat explains. Both couples took steps to market their business, creating new websites and employing Expedia to draw new guests. The results have been “fantas­ tic,” Pat says. One challenge both couples faced was how to attract business during their first winter, the normal off­season and one especially harsh this past year. “We had to scope (the area) out and see what was available,” Nadene says. With the Pinery Provincial Park close by, Bee’n’Bee is able to offer snow­shoe­ ing, skiing and tobogganing. Meanwhile, Brentwood on the Beach offers retreats, including those devoted to quilting, scrapbooking and reading, so guests are able enjoy themselves when the weather doesn’t cooperate. Both couples agree one of the greatest perks of running a bed and breakfast is “meeting new people,” Pat says. he calendar may still say summer, but now is a great time to review what’s new and start planning your fall wardrobe. “New fashions can seem extreme when first viewed on the runways or in magazines, but by the time they arrive in store, the trends have morphed into very wearable clothes that will update and freshen your personal style,” says Darlene Sharpe, the assistant buyer and manager at Susan J Fashions. A handful of fall fashion must-haves and a few shots of seasonal colour are likely all that’s needed to bring your wardrobe up to speed. Stalwart neutrals of black and charcoal set the tone and pair well with fall’s more colourful fashion hues, which include blue, wine, plum, magenta, green, goldenrod, orange, blush pink, teal and turquoise. Popular patterns include glen check, geometric, floral, snake and animal prints. “Strong individual (clothing) pieces that are easily layered play the main role for fall, with many styles highlighted by modern asymmetrical shapes, high-tech materials, neoprene, glossy finishes and faux fur trim,” says Giuliana Athans, the owner of Moda di Giuliana. “A key piece is the indoor-outdoor coat, which replaces the blazer as a fashion statement,” notes Athans. Wear indoor-outdoor coats over skirts, dresses, pants and jeans to express your style. Other fall must-haves include oversized sweaters, bomber jackets, boot-cut trousers, soft flowing pants and midi length skirts and culottes. www.mugfordshoes.com top LeFt A graphic topper adds a layer of style over turtlenecks and other fall wardrobe essentials, such as leggings and slim pants. The outfit is by Luisa Cerano and is from Susan J Fashions. BottoM LeFt A soft, unconstructed, fringe-trimmed jacket makes an easy transition from casual to dressier occasions. The jacket by Riani is from Susan J Fashions. top RigHt A brocade indoor-outdoor coat dresses up anything it is paired with, including this skirt and turtleneck. The coat and outfit are by Laurel and are from Moda Di Giuliana. BottoM RigHt Asymmetrical details, pattern and swaths of colour add up to a layered look that swirls with style. The outfit by Michael Phillips is from Sara Sohan. FoLLowing page  A neutral toned indoor-outdoor coat dresses up jeans and other fall wardrobe basics. The outfit by Laurel is from Moda Di Giuliana. Experience our unrivaled level of service. So much more than just shopping! Choose from a full range of designer clothes. h, summer! Sunshine, warm breezes, the scent of fresh-cut grass. Aug 8, 2015 noon to 4pm Bring your wings! nce known as one of Canada’s prettiest towns, Goderich continues to recover from the tornado of 2011 and again earns that moniker. Celebrating its world famous sunsets, this charming village on Lake Huron features ceremonies with music from the Celtic Blue Highlanders Pipe Band each Friday at Rotary Cove from July 10 to August 28. Piping Down the Sun is a must-do for your list when visiting here. Spending a day on the beach at Goderich is a summer essential for locals and visitors alike. With swing sets, tables and pavilions, a day spent picnicking by the water will please all members of the family. Stroll along the 1.5 kilometre boardwalk to enjoy the beauty of Lake Huron, while enjoying a delicious ice cream cone. If your walk has made you hungry, pop into Goderich Harbour Restaurant for some their famous fish and chips. If you’re in the mood for a more substantial meal, in town Thyme on 21 offers casual fine dining. A menu that emphasizes fresh, local ingredients can be enjoyed in the ambiance of a lovely century home. On Saturdays and Sundays, flea and farmer’s markets take place in the city square, where local farmers and artisans display their wares. visit www.ontarioswestcoast.ca for details on these and more events! here’s a peace and tranquility pervading the river valley fields and pastures at Hearthstone Farm that visitors describe as “magical.” Gail Lamb, owner of the boarding and riding facility outside Lucan, feels it in the evenings when the staff has gone home and she goes out to the barn to tuck in the horses for the night. “It’s my favourite time,” Lamb says. “It’s quiet with just their soft nickering because they want their bedtime treat of beet pulp.” The horses feel the magic, too, she believes. It can take up to three weeks for a horse to be comfortable in a new environment, but they usually settle in in a matter of days at Hearthstone. Maybe it’s the love they feel from their landlord and her staff. Stable manager Casey Gardner has been the main caretaker at the barns for two years. She studied equine management at the University of Guelph, an educational pursuit that only strengthened her love of horses. Beauty & Good Health Begins on the Inside Simply Coco Loco Sun Care Protect the skin from harmful UV rays 3 ingredients and it works! Love Bug Spray It really works! Made with 7 ingredients, just spray it on! Bottle ABOVE Gail Lamb’s lifelong love for horses has enabled her to help others express their own equine delight, as she trains horses and their riders in the fine art of dressage.